At Miami Valley Smiles, we understand how dental problems like tooth decay, broken and missing teeth can affect not only your oral health but your ability to enjoy your favorite foods and smile with confidence. We also understand the hesitation and anxiety many folks face when it comes time to schedule a dental appointment. We want you to know we use only the most advanced technology and materials and will do whatever it takes to make your experience with us as quick and comfortable as possible. Tooth colored fillings, if you ask us, are one of the greatest inventions since sliced bread. In the past, we would use metal amalgam fillings that were not only unsightly and unstable but potentially toxic to the human body with the use of mercury. Tooth colored fillings are completely safe, more durable with temperature changes and regular wear and tear, and they blend in seamlessly with your natural teeth. If you have a tooth that’s badly decayed or broken, you may need a crown to restore it to health. Crowns are tooth-shaped caps that fit over any remaining healthy tooth structure to bring the tooth back to full health and function. Most crowns today are made from tooth-colored porcelain that looks, feels and functions just like natural teeth. A new crown can protect your tooth and maintain oral health while restoring function and aesthetics to your smile. If you have a missing tooth or teeth, we can fill the gap, bring balance back to your smile, and help you enjoy your favorite foods again with a beautiful and durable porcelain bridge. 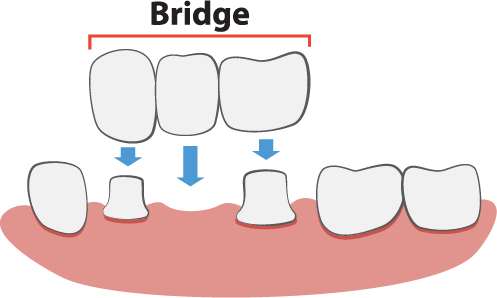 Bridges typically consist of one or more fabricated teeth, anchored to the neighboring teeth with crowns on either side. 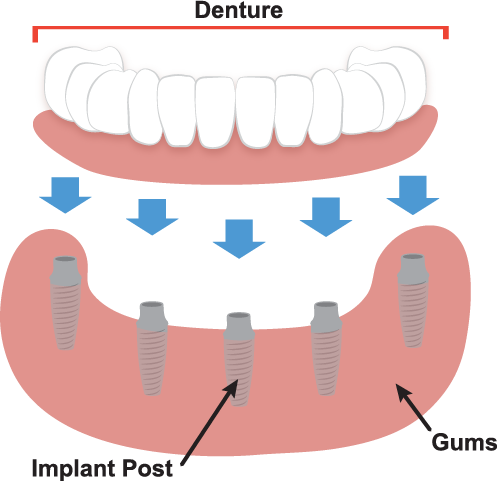 If you are a candidate for dental implants, we always recommend them for replacing missing teeth. We can replace a single missing tooth with an implant and a crown, preserving the neighboring healthy teeth that would be compromised with a bridge. If you’re missing multiple teeth, we can use implants to conserve neighboring teeth and lock your bridge in place. If you’re missing most or all of your natural teeth or living with old ill-fitting dentures that are getting in the way of living your best life, we would love to help you. We have plenty of options available for partials and complete dentures to suit your needs. Our dentures are made from the most durable ceramic and acrylic that mimics your natural teeth in form and function. If you are a candidate for dental implants, we highly recommend implant supported dentures for the healthiest, most secure solution that you can clean and maintain just like natural teeth. If you have any questions about restorative dentistry or would like to schedule an appointment with your Miami Valley restorative dentist, Dr. Lance at Miami Valley Smiles, give us a call today at (513) 445-4064 or request an appointment online below! We look forward to smiling with you.